Aquatic: living in either fresh or salt water. 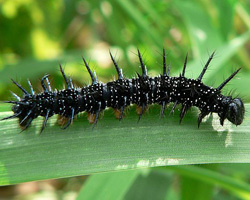 Caterpillar: the larva stage of butterflies and moths. 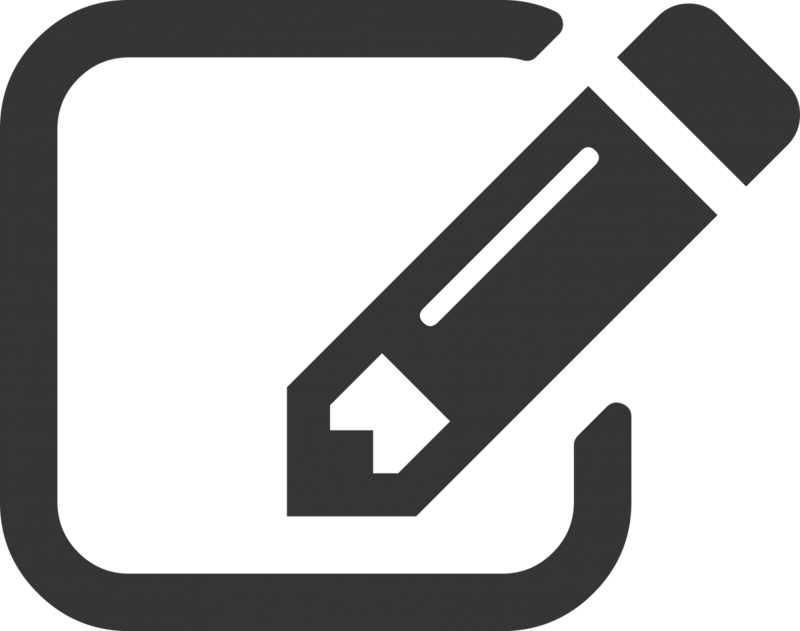 Regurgitate: to vomit partially digested food. Birds and some other animals feed their young regurgitated food. From beauty to beast or ugly duckling to a beautiful swan, insects show some amazing transformations. Below are larvae on the left next to their adult forms on the right. 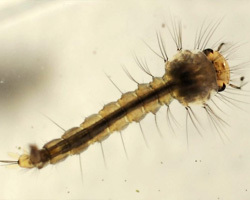 Mosquito: Mosquito larvae are aquatic and can be found in pools of still water and even puddles that form from rain and melting snow. Adult female mosquitoes have special mouthparts used to feed on the blood of humans and other animals. They eat blood to get the nutrients they need before laying eggs. 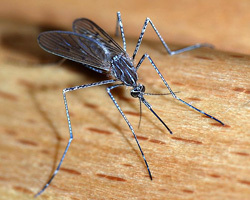 Male mosquitoes feed on plants and nectar instead of blood. 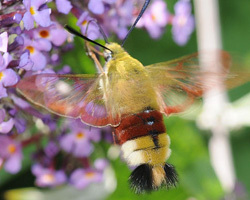 Bee hawk (Hemaris fuciformis): When attacked by predators, the seemingly defenseless bee hawk moth larva regurgitates a sticky toxic substance from their gut onto their attacker. The adult bee hawk moth is extremely quick and agile in flight. It's capable of hovering in place while feeding on nectar from flowers and can also hover from side to side to escape predators. 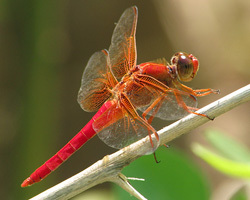 Dragonfly: Dragonflies spend the first part of their lives under water in ponds, lakes, or streams. Their colors help them blend in with the surrounding rocks and sand. Adults on the other hand, come in many bright colors like the Neon Skimmer (Libellula croceipennis) seen here on the right. 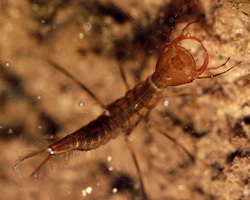 The larvae of different dragonfly species look very similar to each other and are often very difficult to identify. Photos by Pierre Deviche. 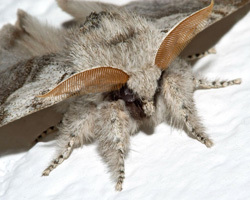 Pale Tussock Moth (Calliteara pudibunda): The caterpillar of the tussock moth comes in two forms, red and yellow (shown here). 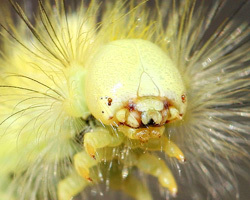 Their bodies are covered with long hairs and soft spines which are poisonous and can cause skin rashes when touched. 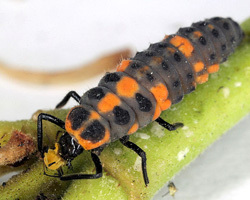 Lady Beetles: Both larva and adult lady beetles make a meal out of aphids and other insects. Because of this, they are usually welcomed by farmers. 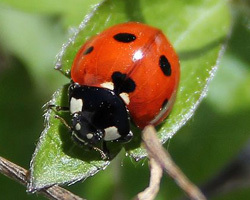 Some people even raise ladybugs for sale to gardeners as a form of pest control to eat other bugs which would harm their plants. 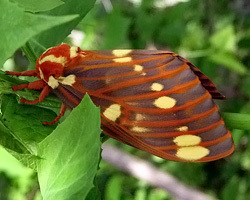 Regal Moth (Citheronia regalis): The caterpillar of the Regal moth is also know as the hickory horned devil for its spiky appearance and the hickory trees that it feeds on. 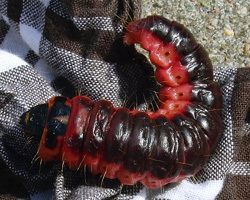 Its prickly spines and fierce appearance helps scare off predators, but it's actually fairly harmless and doesn't bite or sting. 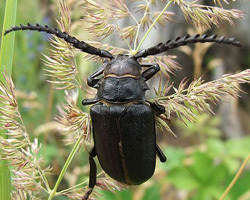 Longhorn Beetle (Prionus coriarius): Longhorn beetles belong to a large family which includes over 20,000 species of beetles, most of which have very long antennae. Many are considered pests because of their diet, which is made up of wood. Their eating habits can sometimes cause major damage to lumber, homes, and living trees. 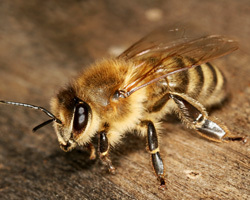 Honey Bee: Honey bees live in colonies where many female worker bees forage for food and take care of the hive. 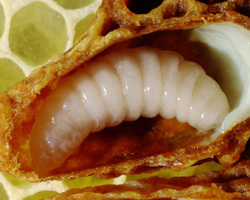 Larvae grow in honeycomb-shaped cells fed by worker bees and don't leave the nest until they've changed into their winged adult form. 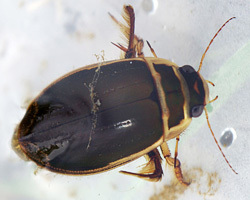 Great Diving Beetle (Dytiscus marginalis): Both the larva and adult form of the great diving beetle are aquatic. These giant beetles have very strong jaws which they use to capture food such as other insects and sometimes even small fish. Adults diving beetles are capable of flight and use their wings to get to new locations. 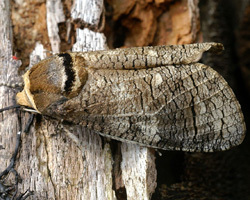 Goat Moth (Cossus cossus): Goat moth larvae feed on branches and wood, drilling tunnels into the trunks of trees with their powerful mouth parts as they eat. 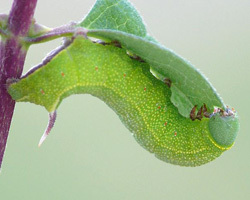 They're often seen as pests because of the damage their big appetites cause to the fruit trees they eat. In addition, the joints in their mouths give off an extremely stinky liquid. 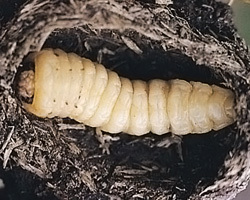 These larvae can take up to four years to mature before changing into their adult forms. 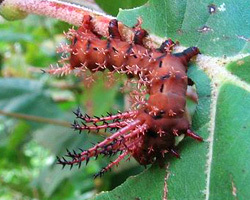 Peacock Butterfly (Inachis io): The peacock butterfly caterpillar is covered with long spines to keep predators away. 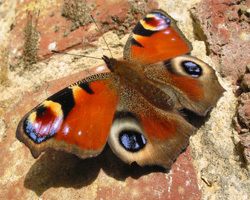 The underside of the adult peacock butterfly is camouflage brown to blend in with its surroundings when its wings are folded closed. When threatened, it opens its wings to reveal bright eye-shaped spots and makes a rustling noise by rubbing them together. It's thought this might scare off predators or, more likely, draw any attacks away from the main body. Additional images via Wikimedia Commons. Image by Clinton & Charles Roberston. 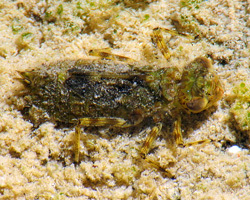 Adult dragonfly emerging from its nymph form.